Davidson River Campground is nestled just inside the Pisgah National Forest and only 3 miles away from the beautiful town of Brevard, NC. 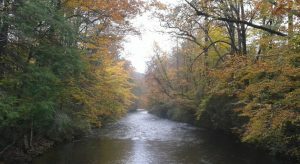 The campground runs along Davidson River, a great place for fishing, tubing, and swimming, and is considered one of the premier trout fishing spots in the southeast. From here you can hike the Art Loeb and North Slope Trails, and right across the street you’ll find all the information you need to recreate in the forest at the Pisgah Ranger Station. The Cradle of Forestry Historic Site, well-known Looking Glass Falls, Sliding Rock, Pisgah Center for Wildlife Education and the Blue Ridge Parkway are just minutes from the campground. Beautiful Asheville, NC is only 45 minutes away, while Charlotte and Atlanta are only a few hours from this incredible spot. Be sure to check out our other campgrounds at North Mills River and Lake Powhatan. Camping in NC ensures you’ll have an amazing vacation!